Just like us needing snow boots in the winter, snow boots for dogs can be a great plan to help keep your dog safe and healthy. It is amazing what our dog’s paws can all go through and rarely are their paws affected by many things. They walk on rocks, over sticks and all kinds of crazy stuff that our bare feet could never handle. I do feel that our dog’s paws could benefit from some protection when it comes to winter and the snow. Protect your dog’s paws from cold weather and ice and snow. I am going to discuss why you should protect your dogs paws in winter, how to size dog boots and what you need to look for in snow boots for dogs to help make it easier for you to pick the right set for your dog, and making sure that you get a proper fitting boot. There are many hazards in the winter for all of us, including our dogs. Not only do we need to protect our dog’s paws, there should also be special care of our dogs during the winter. Conditions for slipping in winter are very probable and adds a risk of your dog injuring themselves when they slip and fall, especially older dogs who are already less stable on their feet. With winter boots that have a non-slip sole, you are going to help prevent your dog from slipping and possibly injuring themselves. Snow boots will prevent the snow and ice build up that dogs will get between their toes. Furry feet will especially have this problem. You might have experienced a time when walking your dog in the winter and they suddenly stop and lay down chewing on their paws trying to get the ice and snow chunks out from between their toes. Snow boots will stop this from happening. Frostbite – In cold weather temperatures, your dog can get frostbite on their pads within 20 minutes, which can be quite painful and depending on the severity of the frostbite, very serious. 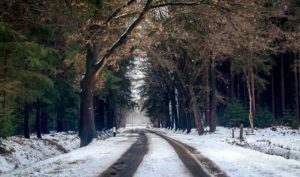 Winter roads have chemicals that are toxic for dogs. your dog, not to mention them dragging that into your home if you don’t wash your dog’s paws when you get home from your walk. It can also be a problem for your dog if they chew or lick their paws. Not only can the ice be slippery, but ice can also be sharp and cut your dog’s pads. It is important that you get the proper fitting boots for your dog. This will make them more comfortable for your dog and help keep the boots on your dog’s feet. When you have decided on the boots that you are going to purchase for your dog, you should refer to the sizing guide for the product that you plan on purchasing. Boot sizes will vary depending on the boot manufacturer. Most of them will have a sizing chart that you can print on paper to ensure a proper fit for your dog. You should take a width measurement and a length measurement. Use your dog’s front paw for a proper fit. Place the paw on a piece of paper and press down on the top of the paw or make sure they are putting their full weight on the paw you are measuring so the paw spreads similar to the spread that they have when walking. You can also lift the opposite paw to make them put weight on the paw you are measuring. Mark the left and right side on the paper and measure the distance between the marks to get the required width measurement. For length measurement, measure entire part of the paw that touches the floor. From the back paw pad to the edge of the toe nail. It is best to make marks on paper for this again and then remove their paw and measure between the two lines. If your dog’s measurements are between sizes, order the next size up, not the size down. Some dogs will require a different size on front feet from back feet. If that is the case, look for boots that are either sold individually or in pairs so you can properly fit all paws. Many boot styles’ the front boots are different than back boots. With these styles, front and back boots aren’t interchangable. There are many snow boots available for you to choose from. Here is some information that will help you choose ones that will work best for you and your dog. Proper fit. Make sure that your dog’s boots will fit them proper or they will either be uncomfortable for your dog, or they will easily fall off your dog’s paws. Easy to put on. The best dog booties will feature wide split seams. They will be the easiest ones to get on your dog’s paws. Snug straps. Boots that don’t have straps are easy for dogs to remove. You will also want straps that are easy to operate and of high quality. Most boots with straps will be Velcro, buckles or snap locks. All of them will work, but Velcro straps work the easiest. Durable/comfortable materials. Most low cost boots are made with substandard materials and will come apart after just a few outings. Look for materials that are comfortable for your dog. Some boots are made with super soft interiors that will be less likely to chafe your dog’s paws. Water resistant. Boots with greater water resistance will typically cost more. You will have to decide how dry you want to keep your dog’s paws by how much you are willing to spend. High visibility. Most of the dog boots will have some reflective stripes or stitching which can be helpful if you have your dog outside after dark for cars to see your dog. Dew claw issues. If your dog still has his dew claws, you will want to read the reviews of others that have purchased the boots. This will help you determine how the boots perform on a dog with dew claws. Some boots won’t work as well on dogs that still have their dew claw. Textured soles. The material of the sole should be textured with a good grip for traction. We are trying to prevent slipping, so the bottom material is important. Flexible sole. Unlike us needing a hard sole on our shoes, dogs boots should have a flexible sole so your dog can walk naturally. If your dog has never worn boots before, it will take some time for them to get used to them. When you first put boots on your dog’s paws, you might notice your dog walking funny. (You might even want to film it, because it can be quite amusing.) They might pick up their paws like they are trying to shake something off their paws, look like they are marching, or high-stepping. They might not even want to move and just sit there. Have your dog wear them every day for an hour the first week. Keep working with them to get them to move around. Get your dog outside. Your dog being active will help them to stop focusing on the boots and the boots will get more comfortable quicker. 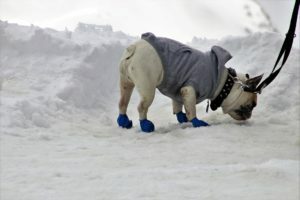 If your dog is having a real hard time adjusting to the snow boots, you might want to start with only 2 boots at a time. Dogs sweat through their paw pads, never leave your dog’s boots on for longer than 5 hours. They could start to irritate your dog’s paws. 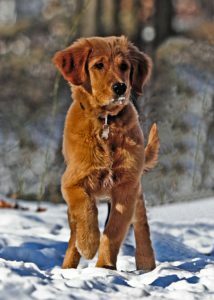 Snow boots for dogs have great benefits to protect your dog’s paws in winter. They not might like them at first, but giving them some time to get accustomed to them will help protect them from slipping and falling, snow and ice chunks between their paws, preventing frostbite and protect their paws from the chemicals that our winter roads have. If you follow the directions that I have provided, you should now know how to size dog boots. It is important to get the correct size to help them be more comfortable and also for the boots to stay put on your dog’s feet. Look for quality snow boots that will provide comfort, but also ease of putting them on your dog’s feet and a good traction sole is very important. You can read best snow boots for dogs for finding recommendated boots. If you have slippery floors in your home, or an older dog that has problems with stability on your wooden or tiled floors, boots are also a possibility to help your dog not slip in your home. This is perfect and timely for me. Since it’s starting to get cold out I was getting worried about my little boy! I’ve been stuck on exactly how to figure out what size he was and your breakdown on how to measure the size was a huge help!!! The Dexas mud buster looks like a good one and am checking that one out now! I’m glad the timing is good for you. It is also getting cold here, and it is important for us to get our dogs prepared for the winter as well. 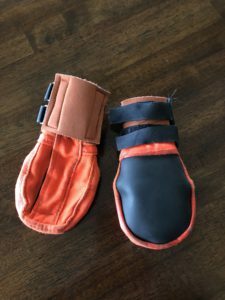 If you take the measurements for your dog like I have shown you, you should be able to find a set of snow boots that will properly fit your dog. If they don’t fit correctly, they will either make your dog’s paw sore or they will be able to get the boots off if they are too large. Dog Booties have come a long way! I never used them for my larger dogs , mostly because the fit was horrible and they always managed to rip them off! I always washed their feet though if they were on a city sidewalk and just to check and make sure they were okay in general. Thank you for the step by step! Especially, the video on measuring your dogs paws to coincide with the text! I will never cease to be amazed at how ‘watching’ someone do something can explain, even the simplest of tasks more efficiently. Do they make booties for hot or, possibly dirty sand as well? I’m asking because I saw an ad for portable paw cleaners (genius!) on this page as well and I have a lot of friends who take their dogs to dog beaches in regularly. Your suggestions on what to look for in a dog boot is super helpful but, I didn’t see any boots brand suggestions. Do you have some brands you prefer over others and does it differ (your suggestions) between dog sizes? Fyre I am glad the information was helpful for you It is great that you check your paws feet after you take them out, not only to make sure they are clean, but also to make sure nothing is stuck in their pads. You can use the same boots for hot and cold protection. I would make sure not to leave the boots on for too long in the summer, since their pads is where they sweat from, and they can get over heated. I am going to write an article on boots that I recommend, and I will get you that information on brands and types that work the best.